Our Executive rooms overlook he Neemrana countryside & are equiped withh all necessities to make your stay comfortable. Ramada Neemrana’s Executive rooms are perfect for your quick business trips into Neemrana. The Executive room offers free wi-fi – which will make you business engagements online a breeze, a safety deposit box, a 32″ LED TV with plugged-in movies and a fully stocked minibar. We also offer dry-cleaning facilities, a travel desk for your travel arrangements, valet parking and town and airport transfers. 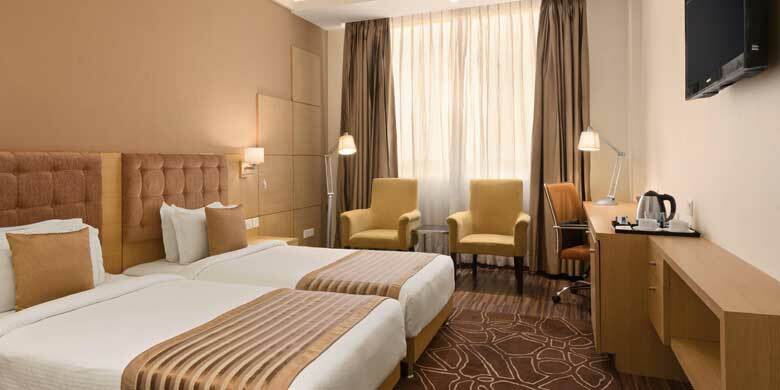 Ramada Hotel Neemrana offers the best in Neemrana hotel rooms, in terms of affordability, luxury and accessibility.Business trips into Neemrana need longer be a hassled experience with having the Executive rooms at Ramada Hotel and its in-house facilities on offer.